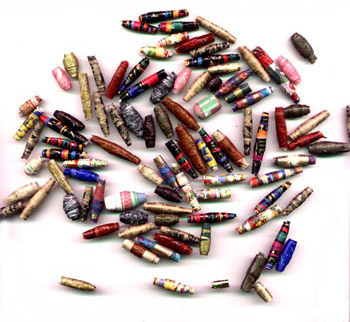 Paper beads are an easy way to get started in bead making, is a great kids jewelry craft, and is great fun for both adults and children. Beads made of paper can also become very elegant and creative in the hands of a jewelry artist, and there are many pro jewelry artisans who have made the humble paper bead into an art form. This tutorial shows you how you can make the basic bead step by step. This is the kind I remember making as a kid from old magazines. * Note : This post contains affiliate links. Affiliate sales help me to keep this blog going so I can continue bringing you free content. Thanks for your support! Shallow cardboard box, slightly wider than the longest straw or swab. Take your card board box & cut notches along both of the long sides. This is what you will be ‘hanging’ your sticks from so the beads can dry. (For kids beads, you can skip this step). 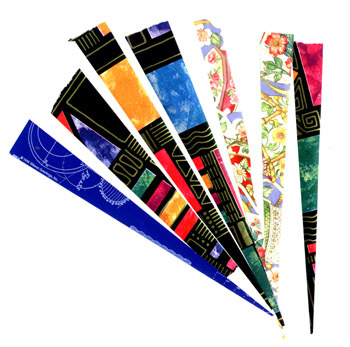 Cut your papers into ½" – ¾" wide strips, about 6" in length at an angle. The paper cutter makes this much faster. (Wide at one end, narrow on the other) The longer you cut your strip, the thicker (bigger) the bead will be when finished. On a big piece of scrap paper to protect your table, lay out a strip of paper and using your glue stick, run it down the whole strip. Start at the thick end and leave about an 1/2 inch, then glue away. Make sure your get enough glue on the pointy end. Apply the glue to the back of the strip using a paintbrush. Spread the glue thinly on the wrong side of your paper. Using your stick or pencil, and starting with the wide end of your paper strip, roll the paper onto your stick, slowly & evenly making sure to smooth the paper as you roll & keep your edges even. If you are making the fat kids beads with a pencil, you can take the bead off your pencil and start on your next bead. If you are making the smaller beads with Mod Podge, let them dry on your drying rack (the notched card board box). During the drying process, be sure to gently loosen the beads every 2 or so hours or they’ll be difficult to remove from the stick. (They will stick, if not loosened). When the beads are dry, and still on the stick, you can coat them with a thin coat of clear fingernail polish or use the Mod Podge (mat finish for a dull look, gloss for a shiny look). Allow to dry, remove from the stick. Your beads are now ready to use for stringing. Create necklaces, bracelets or use as embellishments for other crafts. You can string them on wire or jute, use as tassels on gift tags, collages & journals. Have fun! 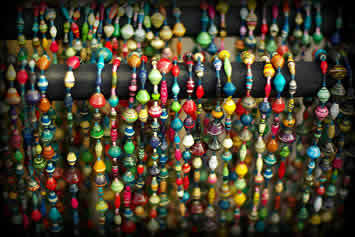 Paper Bead Paper Tips: The thinner / more flexible the paper, the easier the bead is to make. I used several different weights, textures & types of papers & had varying results with each. I liked wrapping paper the best. It didn't curl as much as the Origami paper or tear like tissue papers will and there are thousands of patterns to choose from. Glue: For kids, I recommend glue sticks. For classier grown up paper beads, ‘Mod Podge" is the glue of choice for me. it is available in gloss lustre (it dries clear & shiny) & matte finish (it dries clear & not as shiny). Mandrels: A mandrel is just a fancy word for the tube the you use as a base so your bead has a hole in it. Kids like pencils that are easier for their little fingers to grab, and they like to slide the bead off right away, so glue stick is best. For adults who are letting their beads dry on a rack, you might like the round coffee stirs (from your local fast food restaurant) that look like thin straws. If you are using cotton swabs, remove all the cotton from the ends. Don’t throw this away because you can use it as an added touch to your beads. 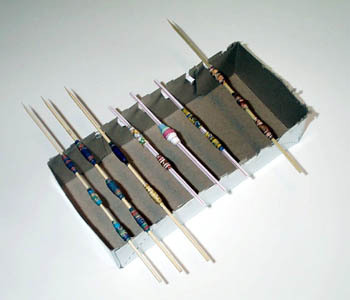 Be sure to use a plastic stick, the beads will stick to a wooden sticks so wooden skewers are out. I found this out the hard way.